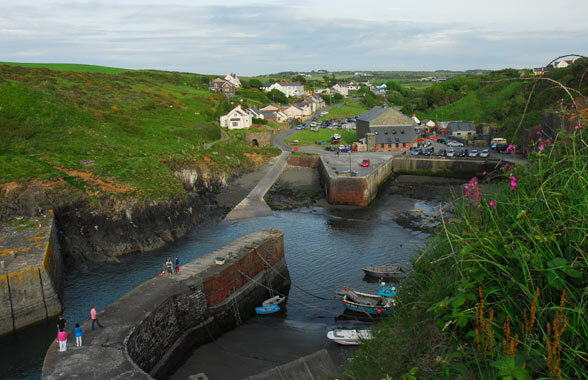 We stayed in a lovely self-catering cottage in the village of Porthgain for 7 days during June 2010. After a good week’s holiday with mostly sunny skies and many good experiences, we wanted to share our knowledge, thoughts and reviews of what we had seen of the area. Aside from driving to catch the Skomer boat, we left the car parked for the week and explored with our bikes, our walking boots and on the bus. Porthgain itself is lovely. It’s a unique, quiet village located on the west coast of Wales near Llanrian and sits within the Pembrokeshire Coast National Park. With Goodwick to the east and St David’s to the west, it offers an ideal base to explore the area either on foot, by bike, in a car or on the local bus service which runs regularly. The full history of the village can be found there or in local books but briefly it began as an industrial harbour in the early 1900’s and is still home to a number of local fishermen today. The popular ‘Sloop Inn’ pub and The Shed bistro offered the chance to relax and enjoy the views whilst sampling the locally caught fish and there were two very nice Art Galleries situated in the heart of the village. Aside from the resident’s housing and some self catering properties, that’s about it but it has a lovely feel to it and is a really nice place to stay. We didn’t make it to The Shed as it was closed on the evening that we wanted to go but we did have a very lovely meal in The Sloop Inn so highly recommend it and the beer was pretty good too! The village is directly on the local shuttle bus route so services are good if you want to explore without the car and you can catch a bus to various places and walk back along the coastal path if you wish. The highlight of the week had to be our visit to Skomer Island on a beautiful day in June and we loved it. The puffins were plentiful, delightful and amazing and we also saw seals, guillemots and a Little Owl to name a few. We drove to Martin’s Haven (allow about an hour and a half from Porthgain as the roads get very small!) and took the Dale Princess over to the island. Return trip costs were £10 per person plus £7 each landing fee but check their website for sailing times and current fees. The whole day out was an absolute joy and we could have stayed there days but unfortunately had to hurry back for the last boat of the day. Aside from the wildlife, the island itself is lovely and we absolutely loved it there. Despite wanting to explore the Pembrokeshire Coastal Path in both directions from Porthgain, we only had time to walk in a southerly direction along the path but loved every minute of it. The scenery is varied and interesting and if you walk in this direction, make sure you visit the Blue Lagoon, an impressive former slate quarry at Abereiddy, by just following the coastal path from Porthgain. You’ll see evidence of the old narrow-gauge railway track and cottage ruins on the way and the route is fairly flat and easy to follow. There are public toilets at Abereiddy beach and refreshments from the ice-cream van if there! We took our bikes with us and explored parts of Cycle Route 4 during our stay, spending one day cycling from Porthgain village to St David’s and back which was a lovely, fairly straightforward route and very enjoyable. The ride was good and we loved St David’s although we didn’t get to see all that was on offer as we spent too long around the cathedral grounds soaking up the sun and the scenery and watching the world go by! We also cycled from Porthgain to Goodwick and Fishguard via Strumble Head and back to Porthgain which to be honest was quite hard work for me and a lot of effort but well worth it. As a fairly keen but not particularly energetic cyclist, I did worry that I wasn’t going to make it home but I somehow managed to get back in the end! We had a gloomy day but the scenery and little villages were lovely, the route was easy to follow and Strumble Head was great but there were some evil hills getting there so be prepared. I now know where the term push-bike comes from and my arms hurt almost as much as my legs did by the end of the day. Due to the weather, Goodwick and Fishguard were rather gloomy by the time we arrived so we can’t really say much about them but we sat in the harbour for a well-deserved rest and enjoyed the views and activity.